A landmark project at St George's University NHS Trust Hospital, London - Connecting Reiki with Medicine - supported by The Reiki Association and all other member organisations of the Reiki Council, needs the support of the Reiki community. The aim of this pioneering initiative is to introduce, independently evaluate and clinically research Reiki in acute medical settings. It is also creating a transferrable clinical training and mentoring programme for Reiki practitioners which allows them to work on acute and high dependency units in a way which can be more readily accepted by the medical professions in hospitals everywhere. Funds are required to support many different elements of this visionary project. 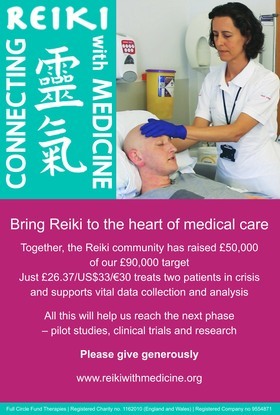 In brief, the project requires funding for data gathering, confidential data management, preparation of reports and case studies, analysis and systematic review of quantitative and qualitative data to support rationale for future research into the application of Reiki in various diverse and complex medical environments. It includes the work of a post graduate Research Assistant (typically a PhD graduate), and an Academic Research Lead based at St George's University of London. Well-designed, publishable clinical research acceptable to the medical profession will take a minimum of two years per project, and costs range from between £25-45,000 each. The St George's and Full Circle research committee includes medical consultants and researchers who have established links with research institutions. Case studies will help build on this and, coming from such a credible and venerable establishments, will lead to more understanding, acceptance and integration of Reiki in medical settings globally. At the heart of it all, the project needs to secure funding for the provision of rigorous, in-hospital clinical practitioner training as part of Full Circle's commitment to evidence based, best practice in acute medical settings, including an extensive six-month mentoring programme for joining practitioners. Thereafter Full Circle needs to ensure continuity in the form of the ongoing commitment and work of the Full Circle team of carefully selected, experienced and comprehensively clinically trained, CNHC registered Reiki practitioners for a period of at least three years, post-training. Please help in any way you can to raise the initial target fund of £90,000. This project and Full Circle will rely totally on donations and receive no government or NHS funding. All funds specifically donated to the Connecting Reiki with Medicine project will benefit Reiki exclusively. "We are pleased to endorse this in-depth hospital-based clinical Reiki programme - the first of its kind in the UK - that will lead to research on the role of Reiki with medicine. We applaud Full Circle Fund Therapies and St George's hospital in their forward thinking in providing the time, facilities and commitment to this ground-breaking initiative. All Reiki practitioners, as well as the people we treat, stand to benefit from the building of a sound evidence base, so we are sure that many people will be happy to make a financial contribution as their part in enabling the success of this project." "The Reiki Association is delighted to support the Reiki practitioners who are participating in the Full Circle initiative at St George's. Our hope is that the work will lead not only to more Reiki in hospitals but also to further evidence-based Reiki projects and continuing research. As funding is coming wholly from donations, we actively encourage all of us who have benefited from Reiki to contribute to the project." "I am glad to see that Reiki is finding its way into St. George's University Hospital. For years we have worked to gain access for Reiki practitioners to be included in programs in hospital settings, and this is a good beginning towards this end. The walls between hospital medical practice and support from Reiki seem to be softening, and I think there will be a lot gained for both parties as this initiative moves forward. I encourage people to get involved in this project and support it any way they are able to."